When visiting the Batanes island chain in the far northern reaches of the Philippines, one island in particular stands out: Sabtang. This island is only home to 1,500 people but is well-known throughout the country for its white sand beaches, old stone houses, and Mission-style churches. After disembarking from the ferry all visitors are required to sign in at the Municipal Tourism Information Center and each pay a P100 tourist fee. Turns out that this list is handed off to the Philippines Coast Guard, who will be at the port that afternoon checking names off the list as they board the ferry to make sure that no one has overstayed their welcome. Behold the small village of Savidug and in the distance the “Sleeping Beauty” of Sabtang Island — can you spot her? 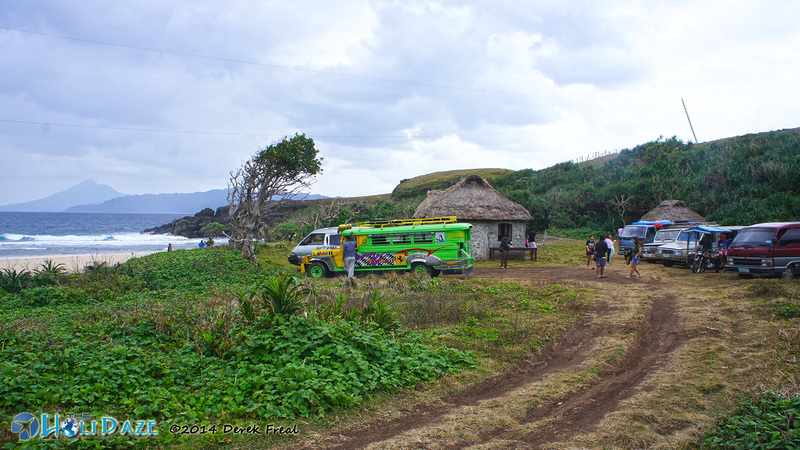 Batanes locals are the Ivatan people and in addition to speaking Tagalog they also have their own dialect, Ivatan. Foreign visitors need not worry though, as some of them do speak English also. Our next stop was the Chavayan barangay, which can only be reached by traveling along a narrow, winding cliff-side road on the eastern side of the island full of blind corners and hairpin turns. Upon arrival the one-lane road forms a U through the heart of the village, which is delicately nestled between a narrow beach and the steep slopes of the inactive volcano that dominates the island skyline. We were informed that the traditional barangay of Chavayan, one of Sabtang’s must-see destinations, is under consideration as a UNESCO World Heritage Site, however I have been unable to corroborate this online. I suspect it could be an example of incorrect information spouted by a tour guide, which happens from time to time, either purely by accident or by locals wanting to make their region more appealing. However that does not diminish the appeal of this small village. Most of the houses on Sabtang are made of stone because of the harsh monsoon season, however this was one of the few which was not. Morong Beach, also known as Nakabuang Beach, is the most recognizable place on Sabtang and therefore also the most common tourist destination — all due to the stone arch you see pictured below. There are a couple huts located next to the beach that serve as a great lunch destination for local visitors — or if you visit as part of a tour then have no fear as these tables will be full of food by the time your group arrives. Sabtang Island is so gorgeous that trimming it down to just these few photos was tough. The next time you visit the Philippines, make sure to add Batanes to your list! Where is your favorite island escape? They target bule especially Americans, and you are both of them! Awesome! Loveeet! Thanks for the post Derek! I have blond blue eyed friends who were in Mindanao for several months. They were fine, loved it, and would go back in a heartbeat. But please keep spreading that kind of information because I’d rather have all that less spoiled beauty all to myself. Cecille what Brad Pitt was in Siargao! when did this happen haha! Lovely photos! Hoping to pursue the Batanes trip this year. Wow, Fantastic photos! That stone arch something else. Philippines somewhere we’ve never been but on our list, have met so many nice people from there. Those houses are picture perfect (as you said)- Sabtang island looks beautiful. I love how passionate you are about the Philippines. Keep writing! I love it. Another place I need to see in the Philippines. Too many beautiful places and not enough time. And I have a feeling that you’ve spent even more time exploring this country than me! This trip was my first one back in four years and it definitely reminded me of why I love this country. Something tells me I’ll be headed back again soon — maybe we’ll finally cross paths there since I won’t be back in Texas anytime soon. Any plans to head back there again this year? We are also planning to go there the last month of the year . Nice writeup there, Derek! Weeeee! We (me and some of my friends) really want to go there later this year! Hehehe! 🙂 The pictures included are awesome, too! *thumbs up! * Yey! Thanks Chiki, I also have a third Batanes article already written, just waiting to publish….hopefully you will enjoy it as much as this one. Nice pictures and story. Where had you been in Indonesia Derek? I know, I know, I’ve missed a lot of the good parts. That’s another reason I am coming back — to visit the places I missed. I stuck to the regions that I could easily get with my motorcycle…Sumatra (those roads are horrible! ), Java, Bali, Lombok, etc. Interesting you mentioned guns…I did see a few rifles in random places, even Magelang, and I always wondered what the legal status of them was. But yeah infrastructure and cleanliness definitely could use some improvement. Ugh, I can’t take how gorgeous that beach is! And I love how colorful the church is. We’d really love to visit the Philippines. I’ve been to the Philippines six times now, more than any other country except for Mexico, and it is definitely one of my favorites. Although the food is not as tasty as in some of the neighboring countries (forgiven me my Filipino friends) the people and the sights there are both amazing. Another thing I love is that there are no scams to be worried about, unlike in other SEA countries — most notably Thailand and Vietnam. People there are friendly, fair, and more than willing to go out of their way to help foreigners. Plus many speak perfect English. Although Tagalog is the official language, English is spoken as well by the vast majority. You cannot even detect an accent of any sort, that’s how well-versed they are in English — and why so many call centers are located there now. The two are frequently mixed, even in mid-sentence on television, which I also find amusing. Thank you for considering my province,Batanes.I am proud Ivatan…. Woo-hoo, so glad to hear that you not only made it up to Batanes finally but that you also enjoyed the experience as much as I did 😀 It really is an amazing place, isn’t it? I’m not surprised that you didn’t want to return to Manila hahaha. How was the weather? Hope it treated you a bit better than it did when I was up there…all those clouds and misty days made my photos turn out rather lackluster. What I wouldn’t give to return again and see some perfect blue skies! It rained some afternoons but it was fine, we went ahead and toured with jackets on haha. Really cold. I spent only 4 days and wished I went to Itbayat, oh well maybe next time! Sounds good to me. Cheers! See you around.